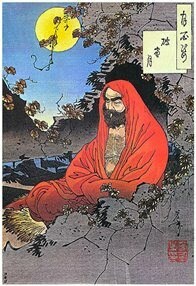 Bodhidharma was a Buddhist monk from southern India. He lived during the early 5th century and is traditionally credited as the transmitter of Zen Buddhism (Chinese: Chán) to China. Legend holds that Bodhidharma “brought” tea to China. He was of South Indian Brahman caste and was born a warrior prince from the Pallava dynasty whose capital was Kanchipuram. through Southeast Asia into south China and travelled northwards. In art he is depicted as an ill-tempered, bearded and wide -blue-eyed barbarian. 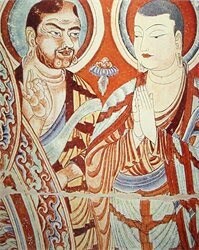 He was also credited for establishing the first Shaolin-Kung-Fu monastary. of monks that he found emaciating in meditation. One popular legend about Bodhidharma recounts how during his period of meditation for nine years near the Shaolin monastery he fell asleep, and when he awoke, he was so furious that he cut off his eyelids to avoid sleeping again during meditation practice. He then threw his eyelids behind him, where upon hitting the earth they allegedly sprouted into tea plants. However, a detailed description of tea-drinking is found in an ancient Chinese dictionary, noted by Kuo P'o in 350 , almost two centuries before Bodhidharma came to China, and there is an early mention of tea being prepared by servants in a Chinese text of 50 thus, it is likely that Chinese tea drinking predates the arrival of Bodhidharma.